Getting here was the easy part. Now he's got to deliver. 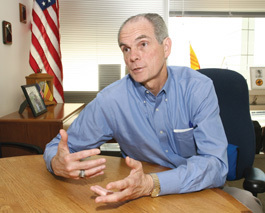 Can Chuck Reed reform San Jose City Hall? CHUCK REED'S cell phone is buzzing like an angry, strangled bee on his desk at City Hall. It doesn't give up throughout most of our hour-long interview. The mayor-elect of San Jose rolls his eyes and confesses that he can't answer it anymore. If he did, he says, he "wouldn't have time to do anything else." Reed has always been one of most accessible council members: at Metro, we never even heard his voicemail message until the day after he got elected. But overnight fame has changed things. For one, Reed says he's going to get a new cell phone number that 100,000 people don't have so his family and staff can reach him. He's also going to change his home phone number in order to cut down on the incessant ringing that has been an unexpected result of last week's election. "There's no hope of going to the grocery store incognito," Reed adds. "People ask, 'What are you doing shopping for groceries?' And I say, 'I gotta eat!'" There's a dazed but hopeful glow on Reed's face as he speaks about taking the reigns of the nation's 10th-largest city. He defeated his opponent, Vice Mayor Cindy Chavez, by more than 33,000 votes—far more than anyone expected after their intensely competitive race over the past year. This wide victory margin has packed a powerful punch behind Reed's vision for change. He is the most popular first-term mayor since Tom McEnery defeated Claude Fletcher 24 years ago. Both Susan Hammer and Ron Gonzales were elected by razor-thin margins. He'll be sliding into the mayor's dais with 10 other council members. Four will be new faces, free of the political muck that plagued the Gonzales administration. In January, Sam Liccardo and Pete Constant will replace termed-out Cindy Chavez and Linda LeZotte. We won't know if Pierluigi Oliverio or Steve Tedesco will be stepping in for Ken Yeager, or who'll be taking Reed's old council spot, until the special election in March. But five out of six of the continuing council members endorsed Chavez for mayor. One ran against Reed for mayor in the primary. It will be interesting to see how the sharpest council critic will become, in his own words, their "leader, collaborator and coach." METRO: Did you or anyone in your campaign have any sense that you would win by such a landslide? CHUCK REED: I didn't think it was going to be that much. I was expecting 10 percent. I didn't have anybody telling me it was too low (laughs). Do you feel there was any connection between your victory and the national demand for change in elected offices? I don't know. I think it's probably too broad a parallel to draw. People who are smarter than me will figure that out. I think what happened in San Jose was really a local election. You were outspent two to one in this campaign, and yet you won by more than 33,000 votes. Is there a message here for people who think elections are now all about who spends the most money? If you have a message, if you have issues, if you have a record, if you really have a reason for running, those are more important. I think the money is really important when you have two candidates that are basically the same, who are pretty much in the same place on issues and record. Then it's much more of a beauty contest. The major spending force against your campaign was labor. As mayor, what kind of relationship do you foresee having with unions? I think we'll work together on issues where we have common interests. There have been those in the past. Labor is a really important player on some issues where we need to do things together, like the BART project. We've also worked together on projects for economic development, like the expansion of the convention center. Sometimes you need allies from a broad community base in order to make things happen. Is there any tension between you and the leaders of the labor community? Well, I don't know. I haven't talked to them recently (laughs). So I don't know what they're thinking, and I'm not spending much time thinking about it. What did you learn over the course of this competitive race for mayor? I learned how easy it is to make a pimple look like a mountain. I became accustomed to the idea that you have to think differently as the mayor. You're not just a councilmember. You have to think more globally about issues. The council members have more luxury to just focus on their districts, figuring out how to fill the potholes and get the parks built. As the mayor, I probably shouldn't be thinking about individual potholes, but how to get money to fill all the potholes in the city. It's a different kind of thinking. Looking forward, do you see any national issues or global issue affecting your role as the leader of San Jose? Certainly the economy will affect it. There were times when the Silicon Valley led the country out of recession. That hasn't happened this time. The national economy and the state economy are very important in getting our jobs back and getting our tax revenues up. We're going to have to work really hard to try to get our revenues growing faster than our expenses. Most people would rather talk about how we're going to spend the money than how we're going to get the money. The mayor has to help figure that out. One of your first major responsibilities as mayor will be pulling together the city's new budget. How do you plan on doing this? I'm proposing a survey of San Jose residents to help in the budget process, to know what people value when we have to make spending decisions and cuts. If we happen to have extra money, what should we spend it on? Then comes a conference on priorities with the neighborhood associations to have more focused conversations on what needs to be done in the neighborhoods and how to balance that with the other needs of the city. The third step is for the council to unfortunately consider all the things that we need to do but don't have money to do, along with new ideas for fun things to spend money on. That all rolls into the mayor's budget message [in the first week of March]. Looking back at the major setbacks you had in your campaign, would you have handled anything differently? Would you have changed the way you dealt with the expense reimbursement issue? I would have found out about it [the expense reimbursement issue] two years earlier and fixed it (laughs). But it never occurred to me that it was a problem, which is part of the "thinking like a councilmember instead of thinking like a mayor" lesson that I learned. Just because everybody else does it, or that's the way we've always done it, is not the answer, not the end of the conversation. You have to think differently. Should that be the way we do it? How will it be perceived by the outside world, by the taxpayers? Even though it's okay at a council level, is it okay at a city level? There are a lot of people who thought I overreacted when I wrote a check for $39,000, which was 10 times more than the stuff that anybody questioned. I think it was the right thing to do, so I did it. 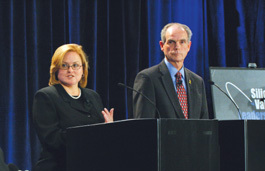 Talking points: With both candidates performing well in debates running up to the election, many believed the mayoral race would be much closer than it was. As mayor, how do you plan to pay for incidental expenses such as Rotary club dues, travel, lunches, etc.? Will you have an officeholder's account that community members can contribute to? Or will you submit them for reimbursement as part of your office account? I'm hoping to abolish the whole officeholder account concept. I think it's nonstop fundraising. Some of the things that the mayor and council members do for their jobs should be paid out of the city budget. When we do that, we'll probably have to get specific guidance on what it can be spent on. Almost all of the things that people could have spent officeholder funds on are okay for spending city money on, with the exception of newsletters. I don't know exactly what the list of things ought to be. That needs to be clarified for everyone. In the meantime, I'm just paying them all out of my pocket, without reimbursement. You've been criticized for being the naysayer, and seven of the council members endorsed Cindy Chavez for mayor. When you become this city's leader, what will you do to strengthen your relationship with the rest of the council? I have been criticized for being the naysayer, but I have not been criticized for being wrong (laughs). So I will continue to try to be right, but it is a different role that the mayor has to play. The mayor doesn't have the luxury of being able to say no in the same way that a councilmember does. I will first have four new council members that haven't been a part of the problems of the past. That's a big difference. I'm also trying to change the way the committees work to give the council members more responsibility. I think there's a bigger role for council members to play on the accountability side of the equation [making sure policy is followed]. I'm intent on sharing power instead of collecting power in the mayor's office. I've always had a good professional working relationship with all of the council members, including Vice Mayor Chavez, despite our political and personal differences. There are many opportunities to work together where we have common interests. Part of my job will be to identify those things that we share in common and bring those policies forward so we can build relationships by working together. Part of the mayor's job is to be an honest broker. The council has given the mayor some additional powers, but the mayor shouldn't take advantage of that power. What does a landslide victory like this suggest for your agenda as mayor? You can't underestimate the power of a 60-40 win. I ran on a very clear platform. The council members understand that people really want a government that's honest, open and accessible. As we work on those issues with the Sunshine [Reform] Task Force, the council will recognize that we need to do these things. There are things we need to do to improve the city and put all of the troubles of the last few years behind us. Everybody wants to do that. You're stepping into the mayor's seat with the intention of making significant changes at City Hall, particularly with the Reed Reforms. If you encounter resistance from your colleagues, how do you plan to deal with it? Usually if there's resistance, there's a reason. Trying to figure out what those problems are and working out an accommodation is pretty useful in overcoming resistance. You've got to help everybody succeed. The mayor has to be a leader, a collaborator and a coach. There have been times when council members are really interested in a certain policy issue, but the mayor hasn't really been interested in helping with it. Council members have gotten frustrated about the inability to move things along. If the council approves something as a policy, the mayor needs to help in making sure the staff does it. What's an example of a reform you think the council might resist? One thing I think there will be council resistance to is changing the mini-mayor system. That's where the council lets the mayor do whatever the mayor wants, and the mayor ignores whatever the council members are doing in their districts. So you get land-use decisions that are really made by a single person, even though they affect the entire city. I think that has to change. Council members are experts in their council districts, but some of those decisions are citywide, and other council members should not feel unwelcome to voice an opinion. The mayor has to help ensure that we do get a citywide view on a project and encourage council members to get engaged in projects outside their districts. Which Reed Reforms do you think are most urgent right now? The sunshine reforms. They're really the key to fiscal responsibility, the key to not wasting money, and the key to not making big mistakes. If we're operating in the sunshine, there are opportunities for the public to weigh in on big policy decisions before we make them, instead of afterwards. Sunshine is how we restore the public's confidence. Then there are the budgeting reforms, which we will start with in January. But without the sunshine, everything else doesn't work. What can be done to expedite the drafting of a Sunshine Ordinance? It has been moving rather slowly through the task force. I'm going to try to go to the next Sunshine Task Force meeting. I've been too busy to pay much attention to what they've been doing, although I've had staff attend their meetings. I need to get up to speed. I'm going to look at what they've got on their work plan, the things they're considering, and figure out what the council can just deal with, without having to involve the task force. Then there are some things that do need task force kind of attention. Will you do anything to bring professional soccer back to San Jose? I hope to facilitate whatever discussions are going on with San Jose State and Lew Wolff. He previously said that if somebody had the land, he could build the stadium. San Jose State has land, and there may be a role for the city to play in that arrangement. I have not yet had any conversations with Lew or San Jose State on the topic. What are your thoughts on the Cisco Field proposal for the Fremont A's? I think it would be good for San Jose to have the A's playing in Fremont, especially if they were called the San Jose A's as part of a marketing decision. Lew Wolff said he gave up on the possibility of coming to San Jose because it was too much trouble. I'm happy that he's seriously looking at Fremont. How do you plan to address the entertainment zone policing issue, which is being blamed by many downtown businesses for driving entertainment customers out of downtown? First I'm going to take a personal look with my own guide. ... I think we'll put together a small party of people, maybe with Sam Liccardo, Dan Pulcrano, Dan McFadden from the city staff, a few others. I want to go look. I've never seen it with my own eyes. Then we need to have a real serious conversation with the chief [of police] and all the people on the public safety side to figure how we can do it differently. I'm not happy with the way it's done now because of this perception of really heavy police presence. I know that other cities do it differently, but I don't pretend to have the answer for how it should be done in San Jose. I was in Denver two years ago for a group meeting with Mayor John Hickenlooper, and I asked him how many officers he had downtown at closing time. He said six. As mayor, you will be appointing a new city manager. What kind of person do you think should fill this position? They have to share my passion for honesty, fiscal responsibility, and open government. Les White has many of the qualities in a manager. They have to be able to manage 7,000 employees. The manager has to be someone who is comfortable with 11 bosses. Beyond that, they should be someone who is direct, not afraid to speak their mind, and does their own thinking. We have to have somebody that can deal with people from around the world, because that's what we have here. Any idea who that person might be? I have no idea. We're going to do a nationwide search. I hope that I can engage the council more in that process than has been done in the past. It's part of sharing power instead of trying to collect power. It's really important to get the right person that will have the confidence of the entire council. What did you think of Mayor Gonzales' outgoing advice? Well, I didn't read it until after the election. It wasn't very helpful to me. I have my own agenda. He has his agenda. Many things on his agenda are on my agenda too. Is there anything from Gonzales' legacy that you will try to build on? Sure. Affordable housing, high-rise housing downtown, the Strong Neighborhoods Initiative, some of the economic development projects he's led on. One great example is the program that's knocked months off of the time for getting tenant improvements in existing buildings. It's a great success. Of course, I'll continue to press for BART. You were criticized during the campaign for not having enough vision for San Jose. How are you going to prove that you do? That was just standard campaign criticism. I don't take anything personal from it. I published a vision in my literature. I've put it in closing statements for the last 30 forums and debates. We'll move ahead on that vision with policy initiatives. Getting the revenues growing is a critical piece of what we need to do. If you look at the elements of my vision, which is San Jose as the capital of Silicon Valley, Silicon Valley as the innovation center of the world, our best days are in front of us, not behind us. It has to do with the economy and the jobs. Those generate the revenues for the pools, the parks, the playgrounds, the better schools, and all of the things that go into improving the quality of life in our neighborhoods. They're all interconnected. If the revenues aren't there, you can keep the swimming pools open. You can't build new parks. Improving the environment is an economic issue as well as a quality of life issue. Talented, creative people come here for the jobs but they stay for the environment. If they don't have a good environment, ultimately they're going to want to move somewhere else where they can have green space and trails and parks. If we don't have good schools, if we don't have safe neighborhoods, those people who have come here will want to go elsewhere.